In April of 2011, a one megawatt high concentrator photovoltaic (CPV) power plant was completed for Nichols Farms in Hanford, California. This is one of multiple distributed generation projects that a leading developer and manufacturer of solar energy systems based on Concentrator Photovoltaic technology has completed and continues CPV on the path to utility-scale generation. The installation will produce 2.244 million kilowatt hours in the first year, which is roughly 70 percent of the processing facility’s electricity demand. The power plant, located on six acres adjacent to the pistachio processing facility, consists of 119 8.8 kilowatt SF-1100S CPV systems. 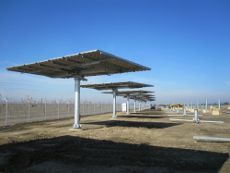 The plant, which utilizes the SF-1100S CPV systems, was designed and built by a well-known engineering and construction firm, and is now connected to the regional electrical grid serviced by SoCal Edison. According to Chuck Nichols, owner of Nichols Farms, “As an integrated grower, processor, and marketer of pistachios, I appreciate the value of harnessing natural resources in an efficient, sustainable manner”. California has a large number of agricultural businesses that can benefit from the implementation of innovative solar technology. The Nichols Farms project is delivering lower operating costs and the impact of future increasing energy costs has been minimized. Two generations of the Nichols family work together to grow, process, package and market pistachios. With this new solar field installed, they can now continue the work they have been doing in a more environmentally friendly way. When Portland Bolt was contacted about supplying the anchor bolts for the solar unit assemblies, we jumped at the chance. At first, the work was attractive because Portland Bolt thrives in being involved in projects that make a difference for years to come, but it became more evident that Portland bolt was an important part of this project when we saw the anchor bolt requirement. Not only were there high strength galvanized anchor rods, but they needed to be assembled with a top and bottom template. Each template had eight holes, meaning that each assembly consisted of eight anchor bolts. Sixty two total assemblies were required for the project, which shipped from Portland Bolt fully assembled and ready to be installed. Needless to say, a flatbed truck was required for transportation.